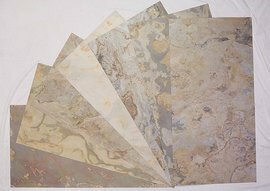 Faux stone is available in more colors and styles than natural stone. Faux stone veneer is less expensive than using natural stone, about 1/3 to 1/2 the cost. It is also lighter, which can make it possible to use without the footings or structural needs that would be required to support the weight of full-sized stone. Faux stone is more porous than natural stone, and will absorb more water and transfer it to the wall being covered, which can lead to damage that would cost money to be repaired.